Originally, dried tomatoes were made by adding salt and being dried under the sun to keep for a long time. Now, there are various products such as those which are marinated in olive oil and those that are salt-free. 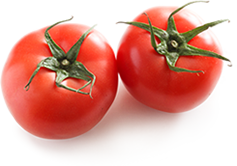 Tomatoes are abundant in the umami substance glutamate. 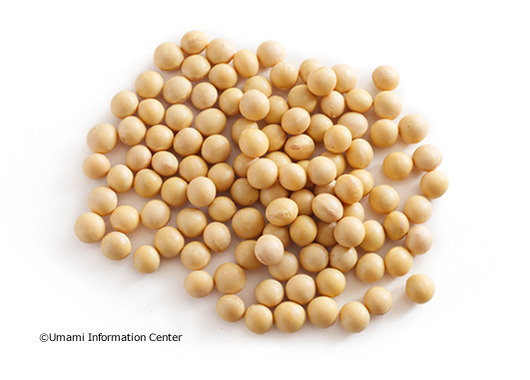 The drying process decreases moisture and concentrates the glutamate. In addition, drying creates the umami substances nucleotide and guanylate. When cooking, dried tomatoes are used for salads as a topping in strips. Rehydrated ones are used in simmered dishes. 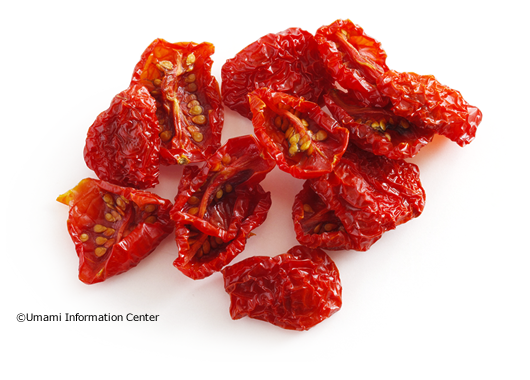 There are various usages of dried tomatoes. Also known as miendo and aoendo, immature green peas are used for food. Many are processed, either frozen or boiled and canned. 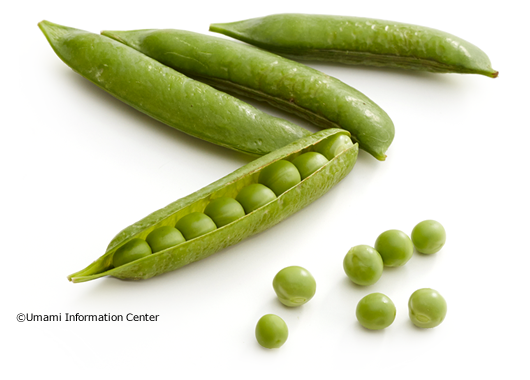 Rich in dietary fiber, the bright color of peas is used in a variety of Japanese, Chinese, and Western cuisines. Because green peas are harvested before they fully mature, their sweetness and umami flavors can decrease rapidly. They should be stored in the pod at a low temperature (1℃) and eaten at an early date for best taste. The rhizome of Nelumbonaceae, or the lotus family, which is said to originate in India or China. They are cultivated in ponds and marshes. They contain a lot of the umami compound glutamic acid, and are also rich in vitamin C. And as rhizomes, they are rich in starch. 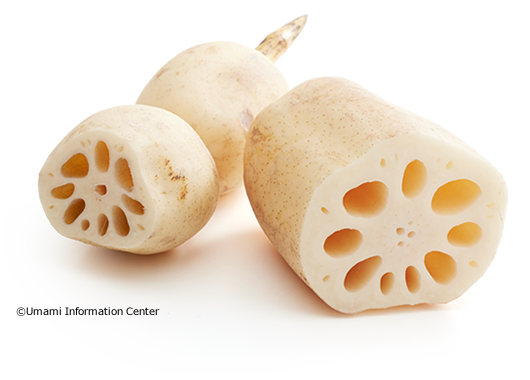 Lotus root is used in kinpira, vinegared dishes, stewed dishes, fried foods, and more. Season: November-February. 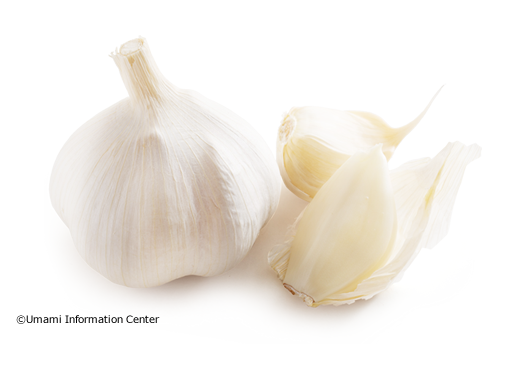 Garlic is a perennial vegetable and is a species from the onion genus. Records say that it was cultivated in Ancient Egypt. We eat a part of the root. It imparts a specific hotness and the smell of allyl sulfide. In Chinese and Western cuisine, it is used to scent stir-fried dishes, simmered dishes, sauces and dressing. In Japanese cuisine, it is mainly used for relishes. It is rich in glutamate. Originating in the Andes in South America, corn was brought to Japan in the 16th century. It is one of the three major crops of the world, together with wheat and rice.The delicious flavor of the edible sweet corn variety is thanks to the umami compound glutamic acid and the sweetness of sucrose. Corn kernels (endosperm inside) contain a large amount of mostly sugar, and corn germ contains a large amount of free-form amino acids and lipids. 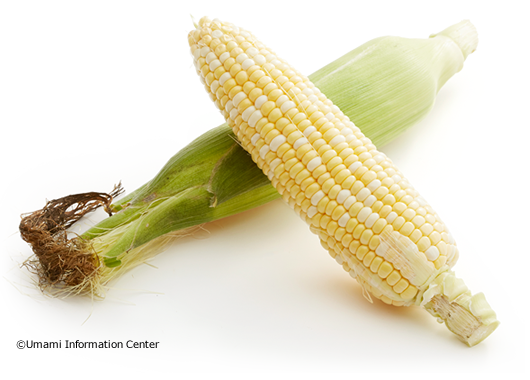 The sweetness and umami flavor in corn used for food decreases rapidly after being harvested. Therefore, it should be stored at low temperatures and eaten at an early date for best taste. It is known by this name because it bears a yellow flower in the spring and has a unique fragrance similar to that of chrysanthemums. Although said to be native of the Mediterranean region, it is used in cuisine in China, Japan, and so on. It contains a lot of glutamic acid, and is also rich in potassium, calcium, iron, carotene, etc. 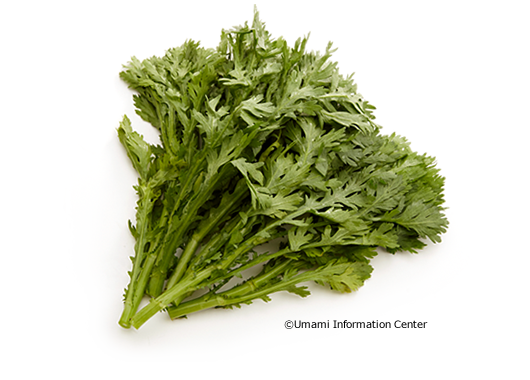 In addition to being used as an ingredient in soups, it is also used raw in salads for its fragrance, and enjoyed in tempura. Season: November-March. Sometimes referred to as ‘the meat of the fields’ due to their high levels of protein, soy beans are also known for offering similar nutrients to meat. Given the number of foodstuffs produced from soy beans (including soy sauce, miso paste, tofu and the fermented natto) it is clear that Japanese cuisine would be incomplete without them. They also have a long history, having been consumed in Japan as far back as the earliest written records (c. AD 600). 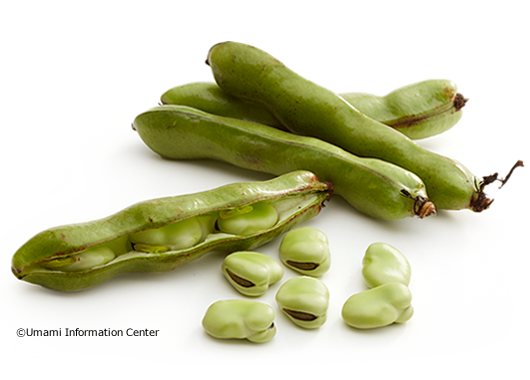 Conjectured to have originated in the Mediterranean region or Southwest Asia, young fava beans are used as a vegetable. They are also used as a substitute for people with soy allergies. It is used in a variety of ways, including boiling with salt, grilling pod and all, in salads, in stir fry cooking, in stews, etc. Season: May-June. Because fava beans are harvested before they fully mature, their sweetness and umami flavors can decrease rapidly. They should be stored in the pod at a low temperature (1℃) and eaten at an early date for best taste. Although wild species of Chinese cabbage, a member of the mustard family, originate from the Mediterranean coast area, its origin of cultivation is in China. 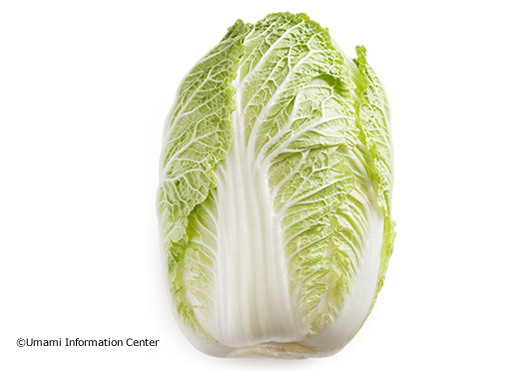 This is a well-known ingredient elsewhere in Eastern dishes, however, Japanese started to cultivate Chinese cabbage relatively lately in the Meiji era. It is used in hot-pots, stir-fries, soups and pickles. The leaves themselves have a mild taste, but when combined with other ingredients, the levels of umami increase considerably. Either on its own or prepared in any number of ways, the potato is consumed on a global scale. It is resistant to frost damage and can be grown relatively easily in areas where other crops might not grow. Potatoes are used in a wide variety of dishes including simmered dishes such as the Japanese nikujaga, in curries and croquettes. They are also popular as a snack when made into crisps, and potato starch is also used as a thickener. If potatoes are stored for a long time at a temperature of just above freezing, their sugar content increases and they become sweeter. 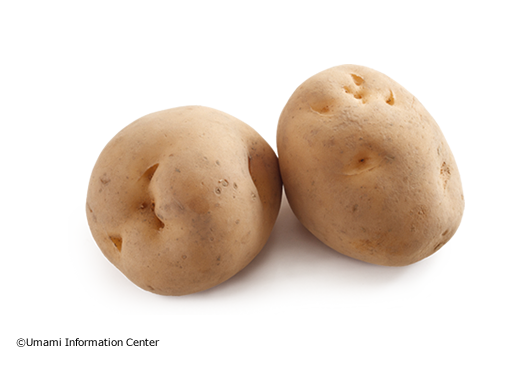 When it is used in soups, the glutamate of potatoes is released and makes the soup umami-rich. Because they are easy to grow on even infertile ground, sweet potatoes are an important crop for many around the world. 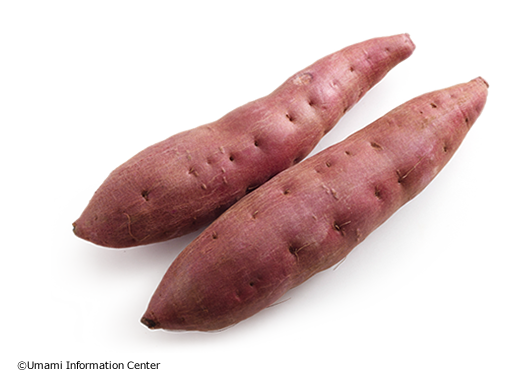 Since it contains amylase, an enzyme that decomposes starch into sugar, sweet potatoes impart sweetness. They are cooked in numerous ways, from ishiyaki (cooking on hot stones) to being dried to accentuate their sweetness and as an ingredient in confectionary. They are also used to make the distilled Japanese spirit shochu. They impart umami as well. A well-known leafy green vegetable especially delicious in the winter. It originated in the area stretching from the Caucasus region to Iran between Europe and Asia. Because it contains oxalic acid, it is boiled and soaked before eating. It is rich in the umami compound glutamic acid, as well as iron, potassium, carotene, vitamin C, folic acid, etc. 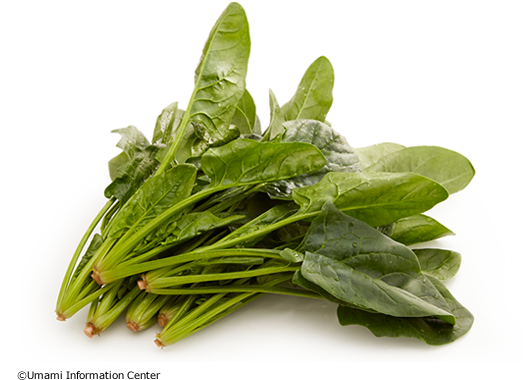 Spinach is a vegetable used in a variety of ways, including in boiled greens, chopped dishes, stir fry cooking, potage soups, etc. Recently, an improved spinach has been cultivated to be used raw in salads. 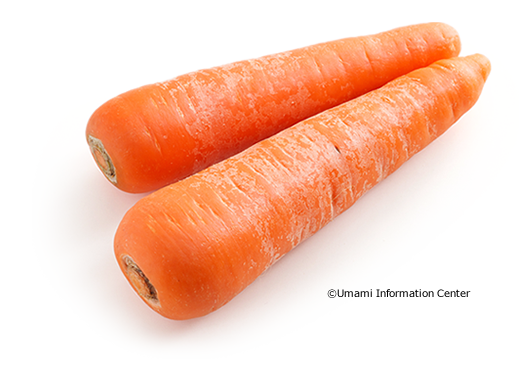 The carrot is a vegetable rich in carotene. The carrot is very versatile, and it can be consumed raw as well as stir-fried or simmered. Due to its excellent balance of colors, it is also often served as an accompaniment to meat, and it is an important ingredient in stewed dishes in many cuisines around the world. Bamboo shoots are the edible shoots of a young stem sticking up out of the ground. They are enjoyed as an ingredient that marks the coming of spring. After they are dug out of the ground, bamboo shoots see a rapid increase in astringency. Therefore, bamboo shoots should be prepared and cooked as quickly as possible. 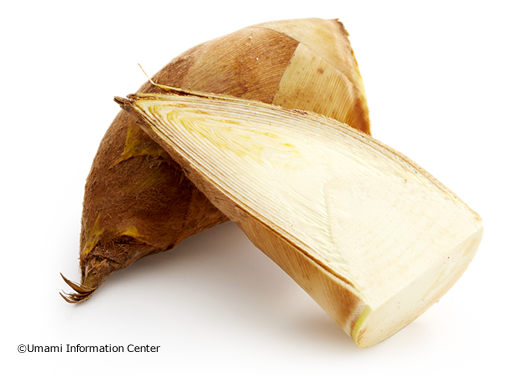 The white powder that appears out of the bamboo shoots when cut into is a type of amino acid called tyrosine, and this has no umami. In terms of maintaining umami, storing in the refrigerator (1℃) will stop the glutamate from decreasing. But stored at 20℃, it will decrease by approximately 50% in two days. It is classified in the lily family, Liliaceae The young spears is the edible part. 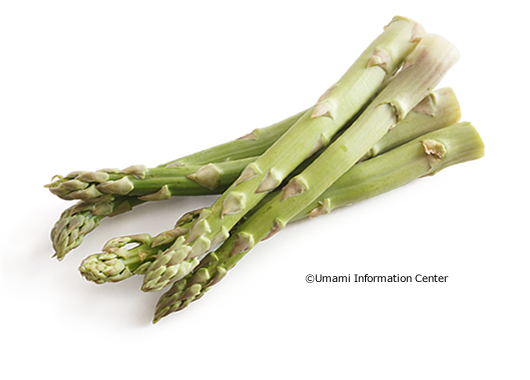 Being rich in asparagine, it was named asparagus. It is widely used in Japanese, Western and Chinese cuisines. The upper part of the spear is richer in glutamate and sugar than the lower part. There are a large variety of daikon dishes and cooking methods in Japan, and the daikon is a must-have vegetable for the Japanese diet. 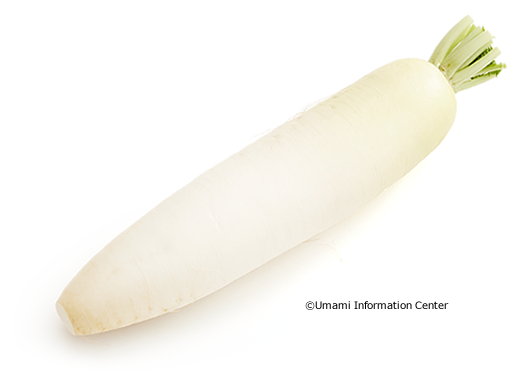 Daikon has much vitamin C, and is rich in the digestive enzyme amylase. When daikon is used as a condiment with meat and fish, the umami compound glutamic acid in the daikon and the umami compound inosinic acid in the meat or fish create a synergistic effect. The umami flavor grows, as does the deliciousness of the dish. By including dashi soup stock in stewed dishes, the flavor of the daikon is drawn out. 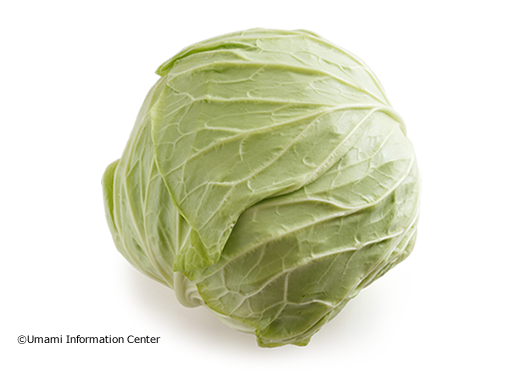 The cabbage belongs to the mustard family and is categorized into various kinds. The heading and texture varies by season; winter cabbage has a hard heading and leaves, and spring cabbage has a soft heading and leaves. Summer cabbage has a hard heading and soft leaves. Cabbages are in the market all year round. It is widely used from being eaten raw to simmered dishes. Regardless of seasonality, any of the crops are rich in glutamate. The onion belongs to the lily family. The root is for eating. In Japan, they started to cultivate it in the early Meiji period. It imparts a specific hotness and smell of allyl sulfide, which supports Vitamin B1 intake. 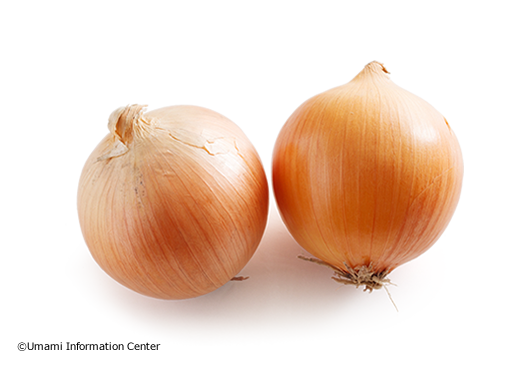 A high glutamate content makes the onion itself tasty, and when it is cooked in soup, the umami spreads. A plant of the Liliaceae family native to China. There are many varieties, including those with thick, white leaf sheaths, those with many separate, thin leaf blades, etc. Allicin, the source of the unique aroma, improves vitamin B1 absorption. Green onions go well with a variety of ingredients and are widely used in Japanese, Chinese, and Western cuisines. 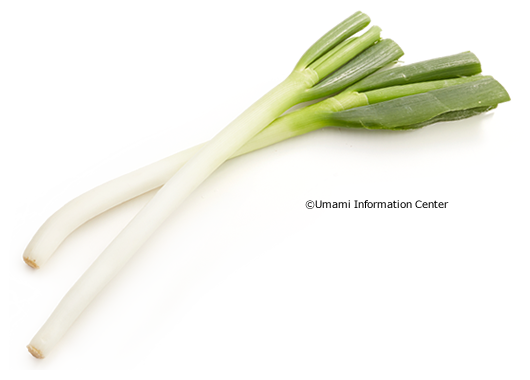 Green onions contain even more carotene, vitamin C, calcium than leeks, and the white portion has a high sugar content. Originating on the Mediterranean coast, broccoli is a Western vegetable that was introduced to Japan during the early Meiji period. A variety of cabbage, the buds and stems are edible. The umami compound glutamic acid is contained in both the stem and the buds, and they are rich in vitamins, iron, and dietary fiber. 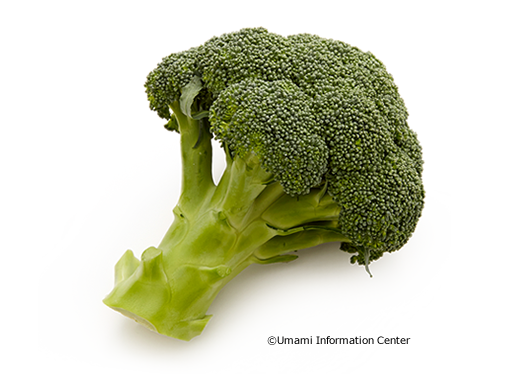 Broccoli goes well with meat and fish, and it is also enjoyed in salads boiled and in stir fry cooking. There are varieties where the stems are pale or dark green. It is a mineral-rich vegetable, and twice the amount of carotene is contained in the leaves compared with the stems. It is characterized by a strong fragrance from the leaves and stems. It is used as a savory vegetable when cooking broths to remove strong odors. 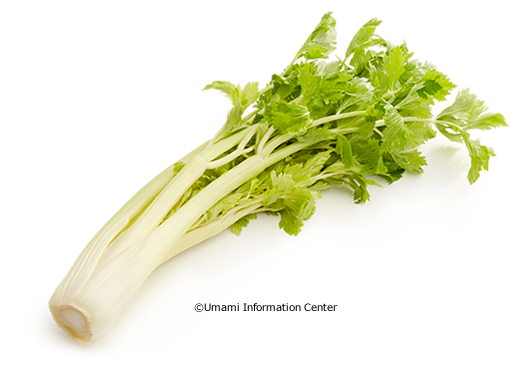 Fresh celery has a weak fragrance and sweetness. It can be eaten raw in salads, and also matches stir fry dishes featuring meat and seafood. An edible crunchy root vegetable. It is essential to stir fry cooking and stewed dishes in Japan, but is not well known in other regions. Burdock is rich in polyphenols such as dietary fiber and antioxidants. The peel contains even more glutamic acid than the inner portion. It is recommended to not peel burdock, but rather wash it with a scrubbing brush and cook with the peel as is. Ginger belongs to the ginger family and has its origin in India. 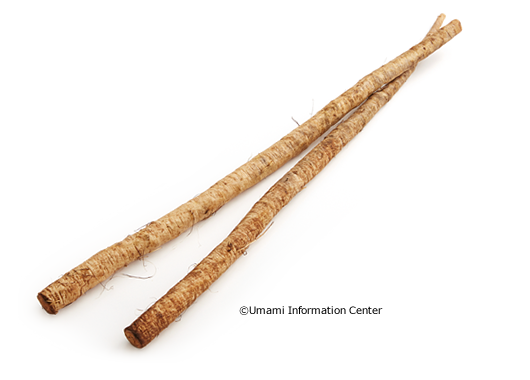 There are two kinds of edible root from ginger plants: Shinshoga and hineshoga. 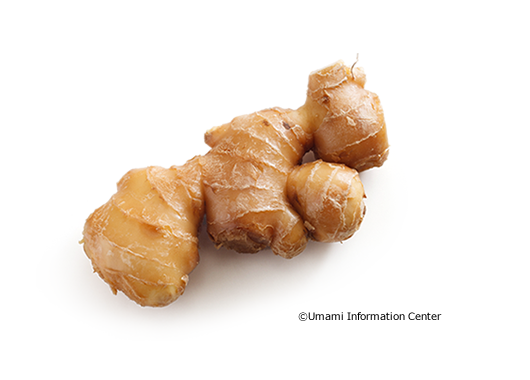 Shinshoga derives from seed ginger. Hineshoga is seed ginger itself that is over two-years old. It imparts umami while it has a characteristic spiciness and refreshing aroma. It is a versatile vegetable, for example it is used as spice. It takes the odor from meat or fish, and it is used in simmered dishes and stir-fries.